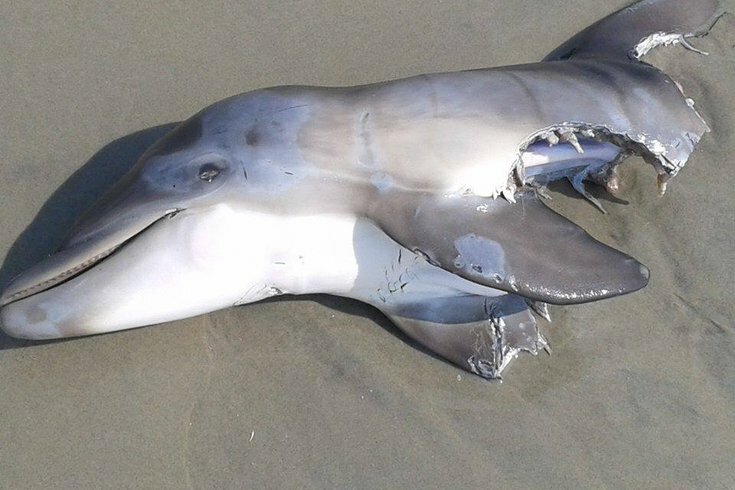 Picture of a dolphin with bite marks discovered along the Jersey Shore. A great white shark is likely responsible for the severed remains of a dolphin that washed up on the North Wildwood beach over the weekend, Dr. Rich Fernicola, M.D., an expert and published author on sharks, told SoJO 104.9. "The lunate appearance of the cut out remaining flesh confirms this [it was a shark]. It was likely a white shark, as a guess, since the edges are so clearly cut away, which is consistent with the serrated teeth of the white variety," Fernicola said. The photo of the half-eaten dolphin - taken by Northeast Philadelphia resident Karissa Kerns and posted to her friend Gene Alesi's Facebook page Monday - has gone viral and is causing concern for beachgoers. It doesn't help that shark spottings and attacks have been in the national media spotlight lately, starting with the tracking of Mary Lee, the great white shark who traveled along the Jersey Shore coastline last month. Just this past weekend, shark attacks were reported in North Carolina, and two teens lost limbs. Fernicola added that sharks feasting on dolphins is part of the circle of life and shouldn’t be of concern to beachgoers. Read the full SoJO 104.9 article here.